Vegetarian Enchiladas filled with butternut squash, black beans, tomatoes and spices are quick and easy to prepare and perfect for a healthy dinner on a busy weeknight! In fact, I love all mexican food. Give me all the tacos, burritos, chips… you get the point 😉 Eating these foods makes me happy and I love that I can have my enchiladas and they are packed with veggies! These Vegetarian Enchiladas with Black Beans and Butternut Squash are an easy way to incorporate a lot of veggies and still give in to your craving for enchiladas! 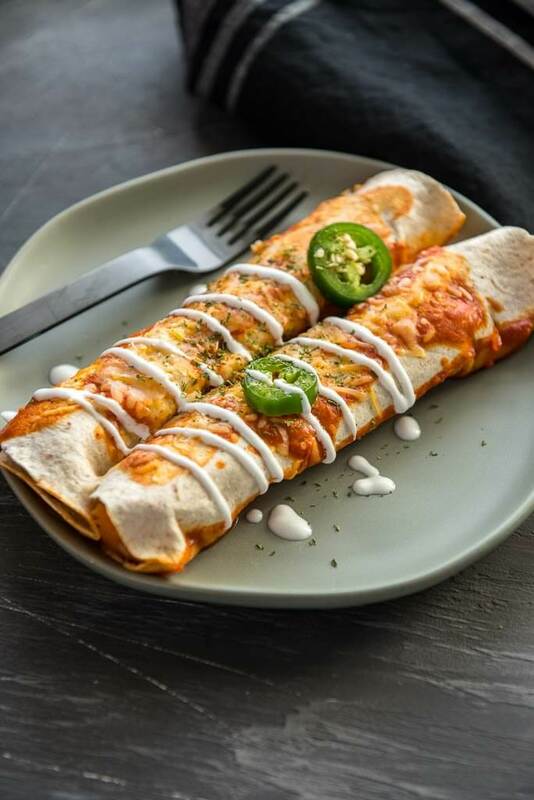 What vegetables do you put in enchiladas? 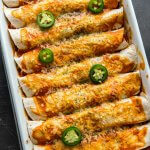 I’ve seen a number of different vegetables in enchiladas such as spinach, mushrooms, onions, sweet potatoes, etc. 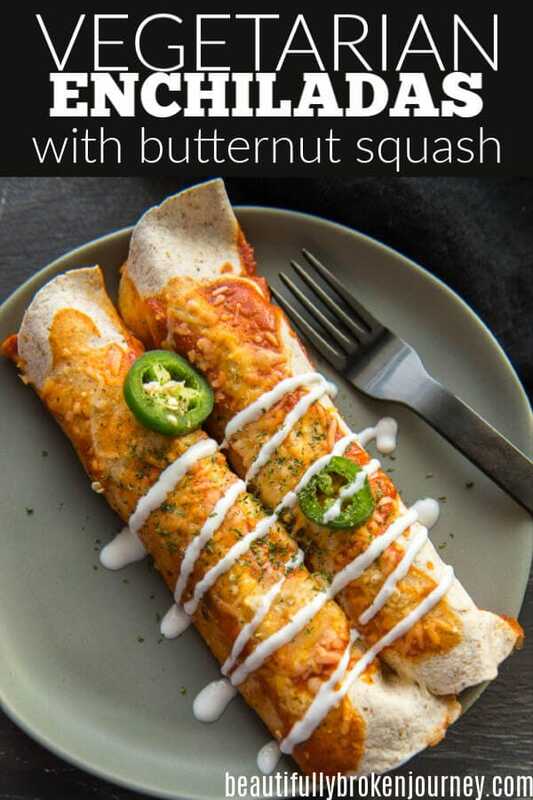 For this recipe I decided to use butternut squash because I love it flavored with the black beans and enchilada sauce. I have two young boys so if I don’t make a slow cooker meal, I want one that has minimal steps and can be prepared fast. These vegetarian enchiladas are perfect because they can be prepared and on the table in under 30 minutes! 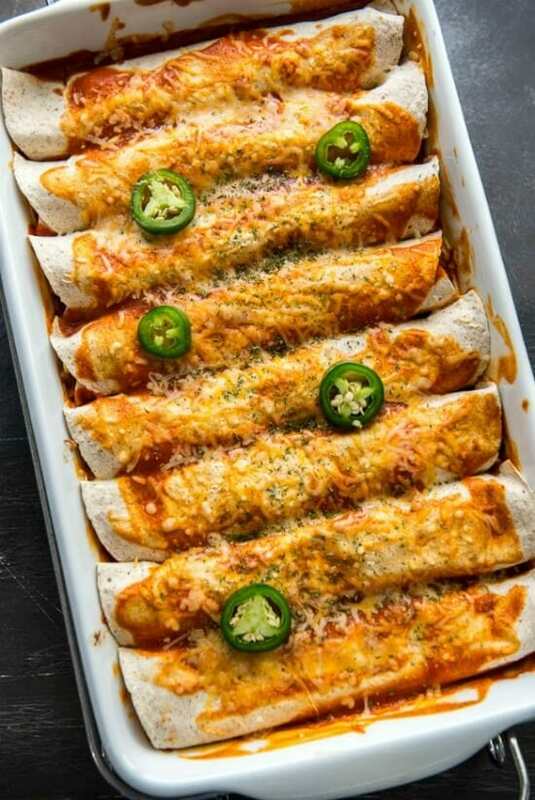 I love to make enchiladas because they are easy. Fill individual tortillas up with prepared filling and roll up into a tortilla, then place into a 9×13 pan. 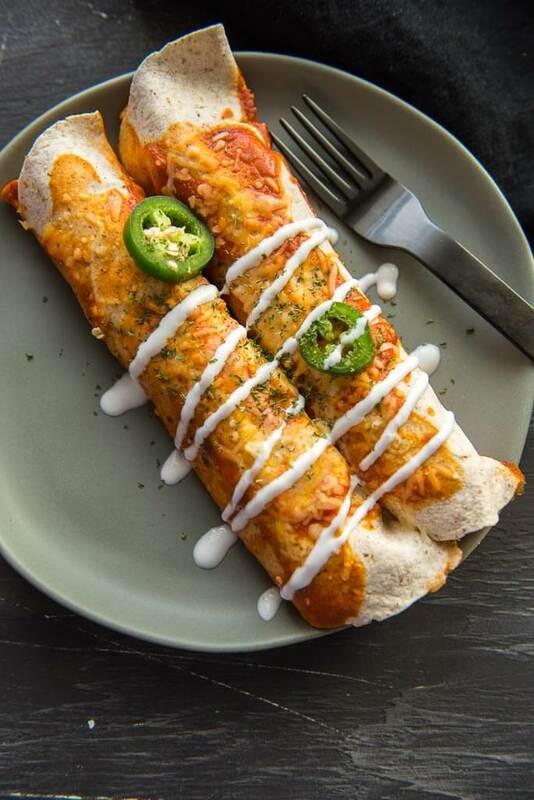 Drizzle enchilada sauce and cheese. These are great if you are a vegetarian or like to have a “meat-free” meal on occasion. If you are vegan you can remove the cheese and they would make a delicious vegan meal. They are a great main dish served with my healthy mexican cauliflower rice, too! I made these with my favorite tortillas, Ole Extreme Wellness. I live in Kansas City and buy them at Price Chopper, or you can buy them here on Amazon. They are soft and have good flavor. Add delicious toppings to make them even more amazing! These are great leftover for lunches. When I make a meal, I always want at least one or two lunches out of it to make it worth my time and help me have healthy options for lunches during the week. I hope you love this recipe! If you do, please share it and tag #beautifullybrokenjourney! Heat olive oil in skillet over medium-high heat. Add onions, diced jalapeño and garlic and cook until onions are soft, about 3 minutes. Add butternut squash, corn, tomatoes black beans and spices to skillet and simmer over medium heat until cooked through, about 7-10 minutes. Do not over cook or the butternut squash will become mushy. Take 1/2 cup enchilada sauce and spread evenly on the bottom of a 9x13 dish. Fill each tortilla with a heaping 1/3 cup of prepared filling. You can add a little cheese into each tortilla or use it all on top of the enchiladas, whichever you prefer. 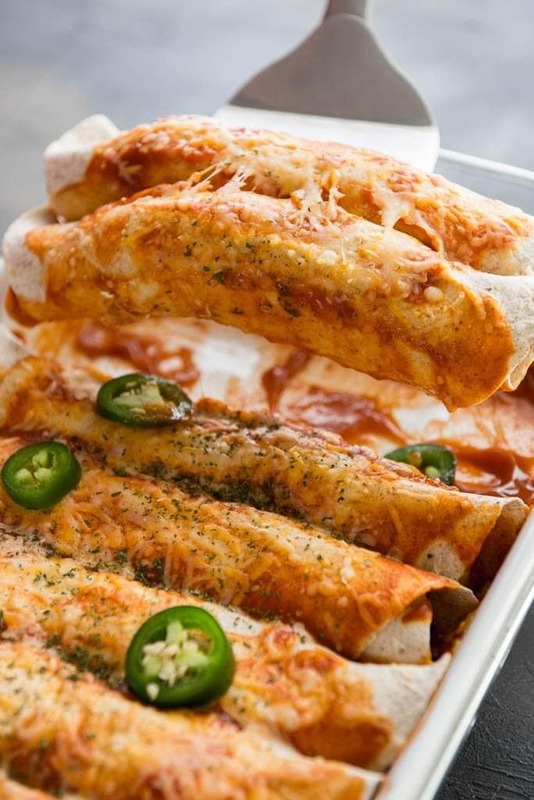 Place all enchiladas seam side down in prepared baking dish and use remaining enchilada sauce on top of enchiladas. Top with remaining cheese and bake for 10 minutes or until cheese is melted. I have a similar recipe on my site – I love Mexican food and I love meatless meals – wins all around!! I’ll go check yours out too, Melissa! I bet yours are delicious, too!